The Tampa Bay Lightning won Game 2 of the Stanley Cup Finals against the Chicago Blackhawks by a score of 4-3 and even up the seven game series at 1-1. Tampa Bay’s triplets line totaled 2 goals and an assist Saturday night. Nikita Kucherov tallied a goal and an assist while Tyler Johnson scored his NHL leading 13th goal of the playoffs. Jason Garrison and Cedric Paquette also scored for the Lightning. Chicago came out slow again but got into their grove during the second period scoring two goals in just over 2 minutes, by Andrew Shaw and Teuvo Teravainen. Chicago found themselves down 3-2 entering the third period for the second game in a row. Brent Seabrook scored to tie the game up 3 minutes into the third. 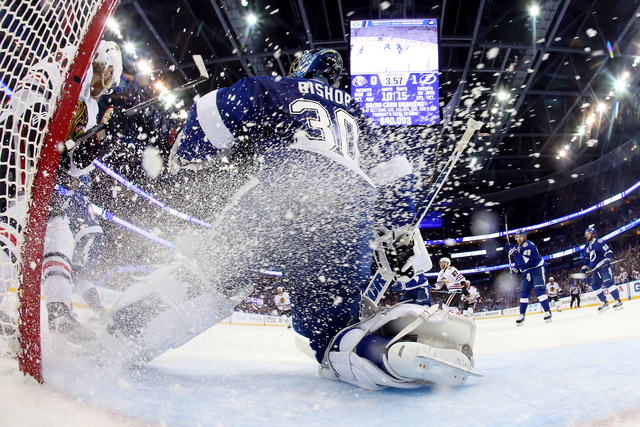 Lightning goaltender Ben Bishop played well Saturday night but left due to what was being called an equipment repair. While off the ice the Lightning took the lead and never gave it up giving 20 year-old backup goaltender Anderi Vasilevskiy the win in net. Bishop returned to net directly after the goal but had to leave again. Bishop leaving the game a second time raised many question as to whether he is injured or not. There was a virus said to be going around the Tampa Bay locker room just last week, which makes it possible that it made its way to Bishop. Luckily for the Lightning, if Bishop is out for a game or two, Vasilevskiy is a highly praised young goaltender who has stepped up when called upon for the Lightning. Game 3 of the Stanley Cup will be played in Chicago at the United Center on Monday at 8 PM ET.